Obviously, a lot has to happen between the two of those events, and it doesn’t happen overnight — especially if you have never grown more than a few herbs before. 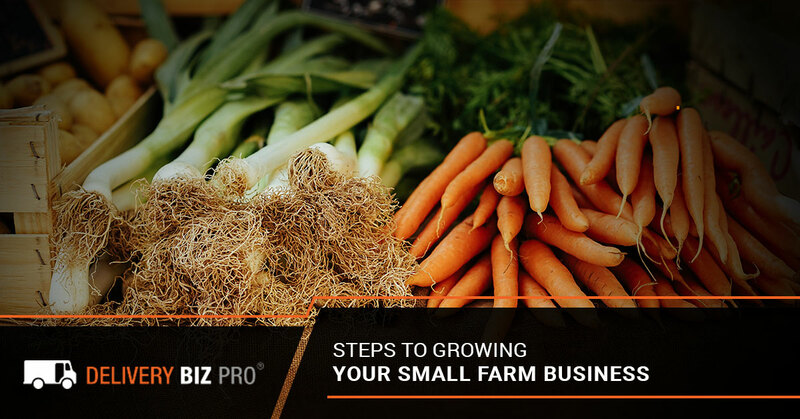 To turn a dream into a business like this, you’ll need land, time, money, and perhaps even special certification or licensing depending on what you are selling and where, as some local areas have their own laws and regulations regarding the sale of produce, dairy, eggs, and other farm items. Delivery Biz Pro is your small farm management software that helps local farmers all over the world manage their inventory, customers, and delivery routes all within one easy-to-use system. Of course, if you are just planting your first tomato plant, you might not need us yet. But for those who are serious about efficiently running their own small farm business, keep reading! This is perhaps one of the most fun things that occur when you begin a hobby farm. Eventually, you find yourself with more eggs or kale than you know what to do with, so you begin to offer your excess produce to close friends and family in the area. Maybe you even sell your eggs by the carton to coworkers who want farm-fresh eggs. You can feel justified charging them for these products because, after all, chicken feed, an irrigation system, and your hard labor doesn’t come free! Plus, even though you have close relationships with these people, they won’t mind spending a few bucks for fresh products. Moving beyond giving or selling your excess produce to friends and family members is the world of the farmers’ market. Farmers’ markets are a relatively low-risk endeavor because if something happens to your harvest, like if your tomatoes are eaten up by a bunch of hungry rabbits, there’s not really much of a consequence other than you won’t sell your products that week and you might lose your vendor fee. Perhaps a few regular customers will be disappointed, but at the end of the day you didn’t promise anyone anything. Farmers’ markets are also a good place to reach out to other local farmers for tips and advice. At the same time, you can put out feelers to those who stop by your tent. Ask them if they would be interested in joining a CSA or subscribing for a produce box delivery in the future. You might find that these services are in higher demand than you thought and you can start compiling a business plan to grow from a stand at the farmers’ market to a fresh produce delivery service. If you are an organic grower or have free-range chickens or grass-fed beef or other production habits that you are particularly proud of, now would be a good time to work towards becoming certified organic or attaining other certifications. This will give you more credibility moving forward and show your customers that there’s a reason to buy local. Finally, once you are sure your green thumb is here to stay, it’s time to start offering a farm-to-home delivery service. This type of service is in demand as more people want to know exactly where their food is coming from and how it was grown. Moving into this business model will require some hard work, marketing efforts, attaining the proper business licenses, and maybe even hiring on a few extra hands to ensure your supply can keep up with your demand. Now, there are different kinds of farm-to-home delivery. Some farmers start up CSA farms, or community-supported agriculture farms. A CSA is a share-based farm where customers buy a share before the growing season to help you fund your farm and produce a hefty yield with your promise that you’ll provide them with a supply of weekly, biweekly, or monthly produce when it’s time to harvest. Typically with CSAs, subscribers get a box of equally distributed produce from that week’s yield rather than choosing which products they want. Other local farmers choose to create more of an online fresh produce marketplace where customers can add products to their cart and have them delivered later on that week. For this type of system, you need to ensure you’re using a good fresh produce software to manage your inventory based on your expected yields so you don’t oversell your items. If you run a dairy farm, or you sell fresh eggs, meat, or poultry, you can also allow your customers to decide what gets delivered each week or place recurring orders for certain items that are always in-stock. For example, maybe one customer needs a dozen eggs and a gallon of milk every week, but another needs two dozen eggs and a half gallon of milk per week. Allowing this system essentially allows your customers to frequently go shopping on your website while still providing you with a steady stream of orders. Also very popular with local farmers are meal kits. Thanks to popular services like HelloFresh and Blue Apron, customers love the idea of having a conveniently boxed meal kit with a recipe that they can cook fresh at home. Even more than that, they love knowing that their meal kits are local and as fresh as can be. If you choose to sell these ready-to-assemble meal kits, you will need a way to track who needs how many servings in their kit, how often they want their deliveries made, and what kinds of meals they want that week or that month. All of this can get very confusing, but using a meal delivery software for local farmers can help immensely. Need A Good Farm-Home Management Software? If you are at a stage in your business model where you are making recurring deliveries to local customers, it is time to invest in a farm-home delivery management software. At Delivery Biz Pro, we provide just that. Our software truly does it all, from customer communication and automated emails and order updates to inventory management and delivery routing. Our goal is to take the hassle out of the logistical side of running a business by offering you complete transparency and customization of your software. We’d love to talk with you more about our farm delivery and routing software! Drop us a line and we’ll set up a time to chat and see if Delivery Biz Pro is the right software for your local farm!